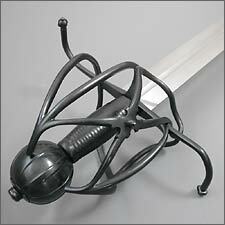 Posted: Sun 18 Apr, 2004 4:31 pm Post subject: Contest: Early Lowland Basket-hilt Giveaway! Win an Early Lowland Basket-hilt Sword! We're giving away an early English/Scottish "Lowland" Basket-hilt sword donated by E.B. Erickson and Angus "Gus" Trim. This sword represents a collaborative effort by these two craftsmen. ElJay's basket, pommel, and grip have been mated with the ATrim blade, assembled and tuned by Gus, himself. 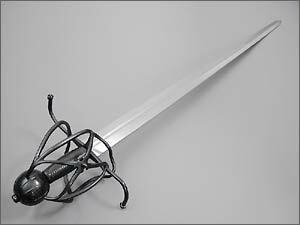 By my account, this sword is a very impressive piece and one that I would personally love to add to my collection. I've told both craftsmen that if it had not been donated to our contest efforts here, I would have purchased it myself. 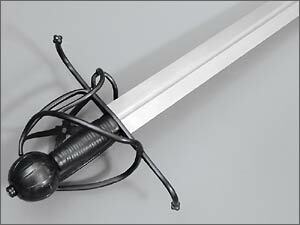 The hilt's inspiration comes from a sword with a broken hilt in the Bolling Hall Museum in Bradford, England. 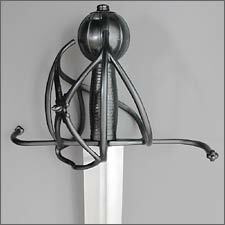 The original's construction is an interesting mixture of crudity (uneven hilt bars, ugly welds) and elegant detail (pommel inlaid with silver wire). The hilt on this contest sword was the prototype for the baskets sold by All Saints Blades, and is inconspicuously etched "Dawgbasket Prototype" on the inside of the rearguards. As a prototype, there are detail and construction differences from the production baskets; the most obvious one being the spiraled rivet on the saltire plates. The original has this feature, as do several other English baskets from the early 1500s. By most accounts, they were for decorative purposes only, although the rivet could presumably make a punch to the head with the hilt more effective! The pommel is a hollow spherical type, brazed together and fluted vertically with a floral end cap. The grip is black leather with wrapped cord underneath. There are decorative finals at the ends of the recurved quillons and the entire hilt is blackened. The blade, a modified AT1215, is fullered and double-edged with a good amount of profile taper. It is made of 5160 spring steel and is heat-treated for optimum performance. The sword is a one-of-a-kind piece and has an approximate value of $700 US! You must be joined prior to Monday, May 31st, 2004. All participants will be entered into a drawing and the winning name will be randomly selected soon after the contest close. Shipping charges will then be calculated, and upon receipt of said shipping charges from the winner, the sword will be shipped! This contest is sponsored by E.B. Erickson and Angus "Gus" Trim. We at myArmoury.com want to thank the gracious generosity of these two craftsmen for their prize contribution. Yet another fantastic contest, Nathan! Thanks! Posted: Sun 18 Apr, 2004 4:55 pm Post subject: Re: Contest: Early Lowland Basket-hilt Giveaway! Wow! I want it. A big thanks to you, and ElJay- Angus Trim- All Saints Blades for providing us with another great contest! It's astounding that you keep coming up with competitions of this quality. Thanks too to ElJay and Gus for the donation to myArmoury.com. I want it! I need it! I gotta have it! WOW!! MAN I hope I win this one! I've been drooling over the AT Baskethilts since I first saw them on All Saints site. Thats what a Reiver Needs! Posted: Mon 19 Apr, 2004 1:32 am Post subject: Nice! Damn, that's a gorgeous blade! Thanks for setting up such a contest! much & good luck to everyone! Wowie, more great contests from myArmoury.com. "It is better to have and not need than to need and not have." Thanks to the sponsors and to you, Nathan! Amazing.... Yet another fantastic contest... Needless to say I think just about everyone of Us wants Our chance to cut water filled soda cans down with this beast :-D It looks like a great sword (No confusion intended). As usual, many, many thanks to everyone who's involved, and best of luck to all. When in doubt, bleed them out. I had the fortune to see some of Gus's baskethilts at the Oregon Knife Collectors show this weekend. Very nice indeed!, would have loved to do some cutting! As if all the features on this site weren't enough, you guys keep giving stuff away! myArmoury.com is the best place on the net. Thanks guys. I'd really like to win that sword - so would a lot of people. I checked and this website has more than 60 new members so far this morning, almost all of them signed up for this contest. 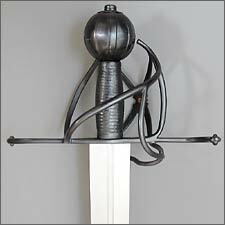 For those who like the swordplay of basket-hilted sword, take a look at http://scrimicie.smithware.ca , in the "basket-hilt" section from the top menu. Some kool videos..
Good luck everyone for this contest ! The specs are in the first post.. measurements are there.. I've already said it, but I'll say it again: I want to keep this sword. Right now it's hanging out with my Vince Evans Lowland Hilt. I think I'll be taking some photos of these two together before I have to give this baby away. Well, you could always give both away, that way there would not be any quandary about keeping or not keeping the pair. Amazing is all I can say......These Contests are the best. I think I'll be taking some photos of these two together before I have to give this baby away. That would be great. I really liked your "Showing of the Schiavona" thread. It's always cool the see swords of the same type from different makers side by side.